I guess I could have worked a lizard in there somehow but I could only think of Daniel Pinkwater novels and a minor character from Fullmetal Alchemist and this is weird enough as it is. Do kids still read Daniel Pinkwater? The odds that anyone gets all 5 references here are kind of slim. 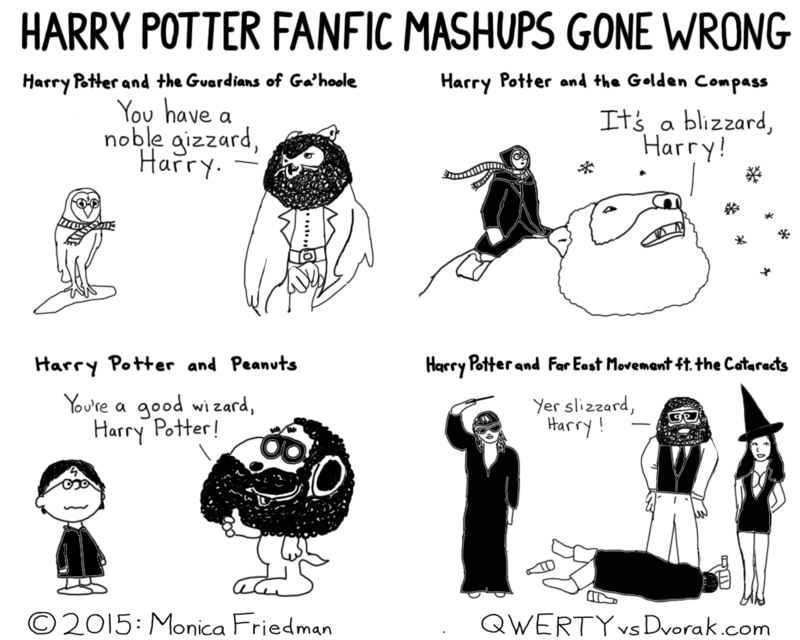 Harry Potter’s pretty universal among a certain cohort, as is Snoopy, but there’s not a tremendous overlap there. I’m sure kids recognize Peanuts, but I don’t know how many of them, outside of the music theater group, know You’re a Good Man, Charlie Brown. A lot of people love His Dark Materials but the first movie flopped and it’s not as popular as it ought to be considering how the book is. Guardians of Ga’hoole is a terrific story, too, but it’s even more obscure. The movie was straight up awful, and there are so many books that you have to be pretty committed to the story. I highly recommend it, though, if you would like to read something that riffs off of Lord of the Rings, is written for kids, and stars a large cast of owls. And then I threw in a terrible, but catchy, pop music song from 5 years ago. So, like everything I do, its potential appreciative audience is already minuscule before I even ask anyone to read it. But here it is. The idea’s been cracking me up for a couple weeks already. I’m dying to see if anyone else gets even a chuckle out of it. At least it pleases me. I like this black and white style too. I’ve been using color and fancy backgrounds to cover up inadequacies in the artwork, but it’s time to scale back and let the lines start speaking for themselves. I have another idea that will look better in this style too, or at least in black and white with only a few colored accents. This entry was posted in webcomic and tagged comic, fanfic, funny, golden compass, guardians of ga'hoole, hagrid, harry potter, mashup, novels, peanuts, snoopy, webcomic, YA on October 6, 2015 by littledragonblue. Yes for the black and white. Three out of 4–not bad, I’d say. Ohh, *His Dark Materials*. Hands-down a fave. I actually never finished the series. Every time I went to get the second book at the library, it was checked out. Now it’s been so long I have to read the first one again.